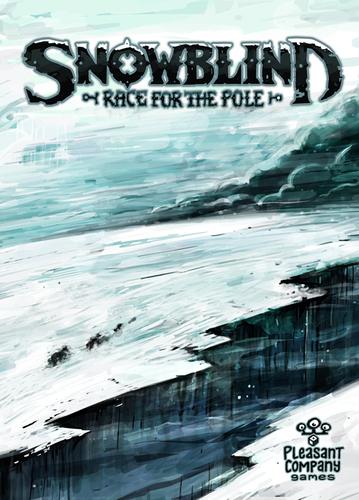 In Snowblind, players lead an expedition to try to reach the South Pole. The four countries which were in the historic race to the pole: Norway, Japan, England and Germany are represented in the game. Each country essentially gets its own column on the board where they try to advance from their ships to the South Pole and then survive the trip back to their ship at the end of the game! Each team starts with an identical setup with a Captain (and supplies) slightly advanced from a base camp with the other scientists and sailors as well as the rest of the provisions. At the start of the game, all of your figures are “active” – that is that they are all upright. Later in the game, they may become exhausted and they will then lie on their sides. 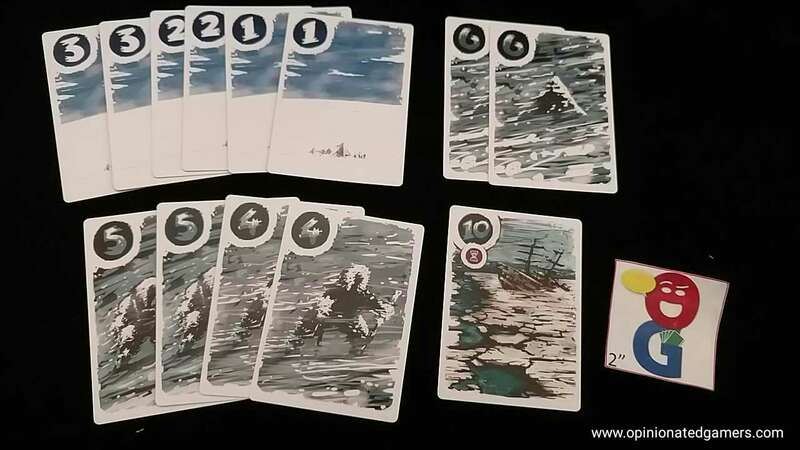 A Weather deck is made with 5 cards drawn at random and a Pack Ice (last round) card shuffled somewhere in the bottom three cards. 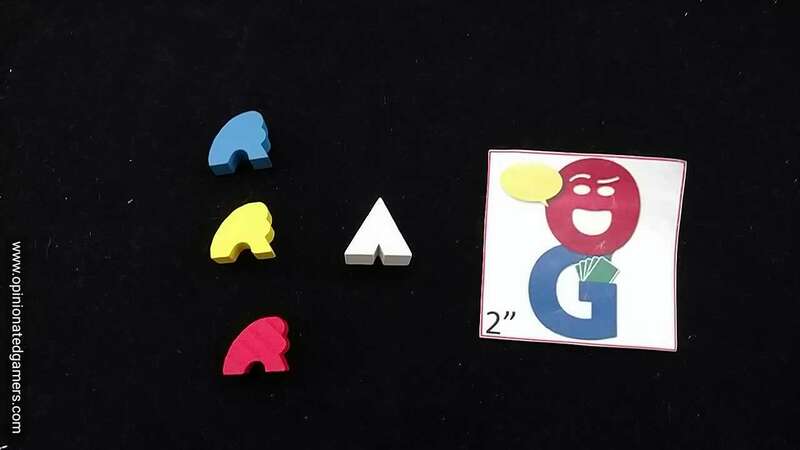 There is an action board also on the table with colorful dice placed on their matching spaces. The dice are either d6 or d8. Red/yellow/blue d6: move an explorer or corresponding color one zone in either direction. You may choose to move up to three crates with that explorer. Red d8: move the red explorer AND one other one zone in either direction. You may choose to move up to FOUR crates with that explorer. Yellow d8: move the yellow explorer one zone in either direction. You may choose to move up to three crates with that explorer. You also get a Research token. Green d6: move either a yellow or blue explorer and a crate one zone in either direction. When you are asked to Roll for exposure, you take ALL the dice in your personal pool and roll them. Any result that is 4 or more can result in potential exposure. An explorer on its own will be exposed on a 4+. An explorer with company (that is at least one other Active explorer with it) is exposed on a 5+. Explorers that are in a zone with a camp are only exposed with a 6+. Each time that you are exposed, you must expend a supply: either a crate or a food. If there are no supplies available, you must then exhaust the explorer – that is, lie him on its side. Active explorers are always exhausted before previously Exhausted explorers. An exhausted explorer that is exposed is removed from the board as he just freezes to death. It is important to note that if you Captain (red meeple) dies, your expedition automatically fails and you are eliminated from the game. Exhausted explorers are unable to take actions, they do not provide company for other explorers and they do not count as occupying a zone. Pretty much the only thing you can do with them is to let them freeze to death OR to spend a supply (crate or food) to revive them and return them to Active status. 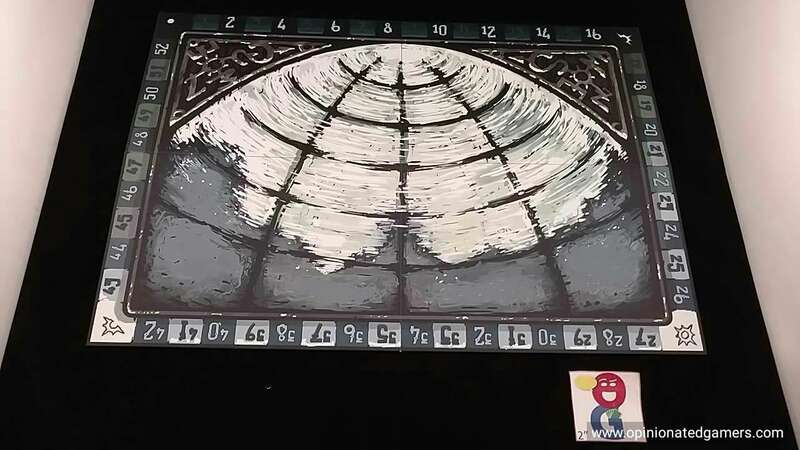 Again, the round continues until all players have Passed. At this time, the top Weather card is drawn from the deck. If this card is the Pack Ice card – this signals that there will only be one more round in the game. Then, players look at the number on the weather card. This number counts as an Exposure roll to each player – but only for the occupied zone closest to the Pole. All penalties must be paid for this as outlined above. All the action dice are now returned to the board and the start player marker is passed around the table. 5/10/15 points for getting your captain to Zone 4/5/6 during the course of the game. As you would expect for a game set in the Antarctic climate, the game is pretty brutal. At its heart, it’s a logistics game. You have to figure out how to move your stuff from point A to B and then back again. If you move too far ahead with your captain, you might strand him and he could freeze to death without a supply chain to support him. Once you get down to the grey d8s, you have to start considering rolling the dice to check for exposure. However, as this is the only chance you have to move an explorer more than 1 zone, it’s a risk you have to take at times. Each player pretty much is in his own column on the board, and really, the only interaction between the players is the indirect interaction of denying your opponents dice by choosing them first. Otherwise, it’s simultaneous solitaire as nothing can be done to affect your progress. There are only 5 to 8 rounds in the basic game (and only 14 dice in each round), so you really don’t have a lot of time to get up and back. Thus, the game forces you to take risks. You will also have to make hard decisions on when/where to sacrifice your explorers to further the cause of your expedition. We have only played multiplayer with 4p, and I wonder how it will feel with 3 players as there is no scaling of the dice pool for 3p vs 4p, and there will therefore be more dice available per round to choose from (though of course, due to your own personal risk tolerance – you might not be choosing to take all the dice each round anyways). 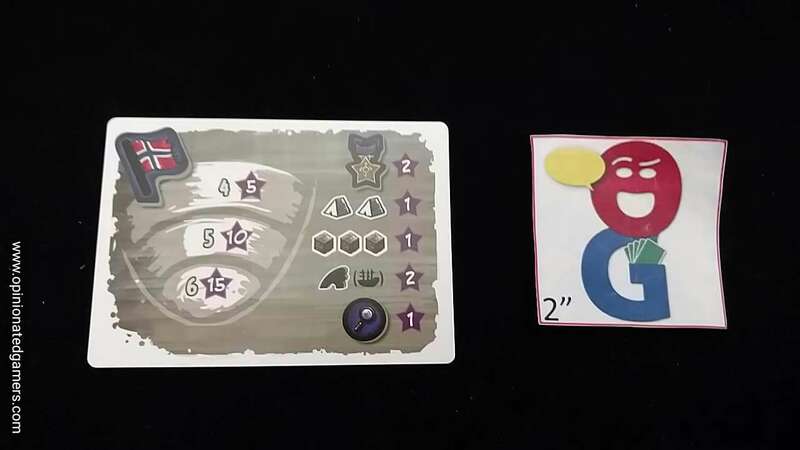 Once you’re used to the basic rules, there is also an advanced version which adds 2 more cards to the weather deck (so now you play 7 to 10 rounds) but you also start one zone further back – so you have two more zones to go to complete the round trip. 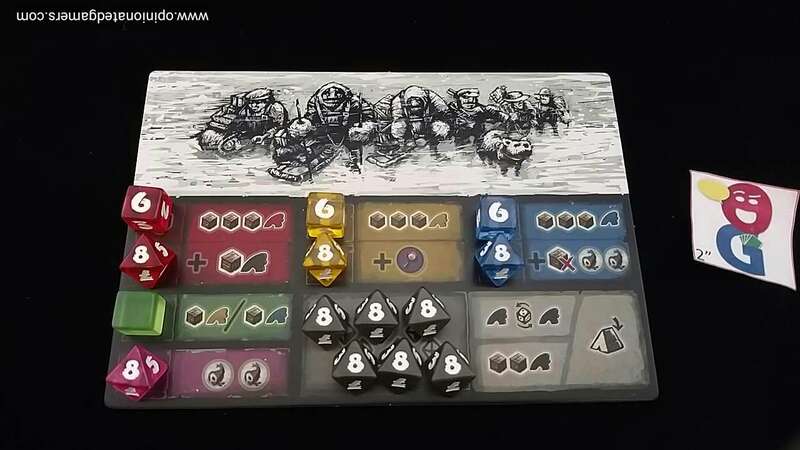 One other thing to note is that Snowblind offers a solo version – the dice pool is lessened (no purple nor green die) and you have fewer members of your expedition. Your goal is go get the Captain to the pole and back by the end of the six rounds of the solo game. It’s a pretty tough challenge, and I barely made it back on my first try. The solo game can also be made more difficult by increasing the number of Research Tokens needed to achieve victory. This entry was posted in Essen 2016, First Impressions. Bookmark the permalink. This one looks a bit depressing.